For like a year, Jill and I made a plan for her, Ryan, Luke and me to go on a trip to Edinburgh Military Tattoo and Fringe Festival. Well, we all let the time pass too quickly to get that one planned, so we had to rethink where to go. 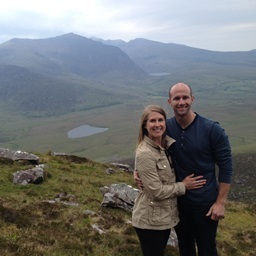 We threw around the idea of Dublin. And then all of a sudden Ryan brought up Paris. Ryan, the man who dislikes almost all things touristy, wanted to go to Paris. Huh!?!?! Well, we took that and ran with it! (Note: He didn't actually want to go to Paris, he just saw that it wasn't too expensive to fly there. Now, that's the Ryan we know!) So off to Paris the four of us went! How spoiled are we?? This was Luke's FOURTH time in Paris and my THIRD. I mean... really... we are living in a dream. Anyway, we all arrived Friday around the same time... Jill and Ryan flew direct from Aberdeen, and Luke and I took the EuroStar train under the channel tunnel. 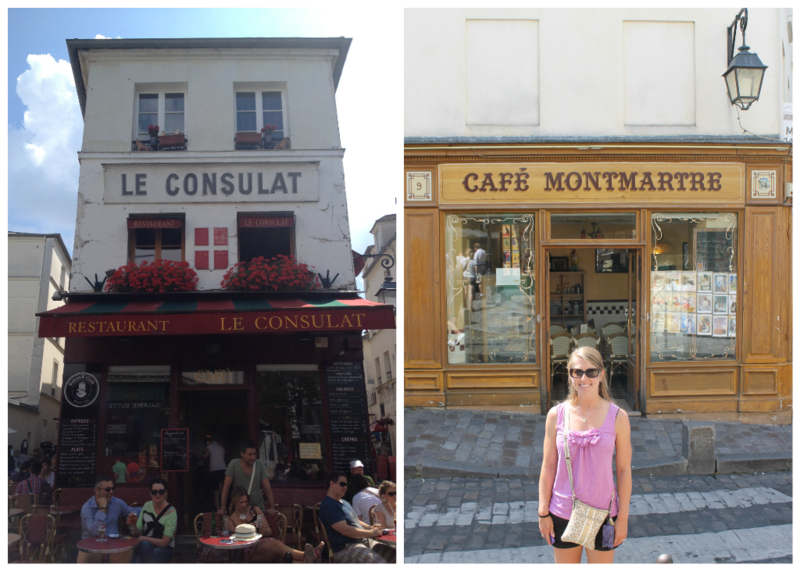 The four of us met at our hotel in St. Germain to drop our bags, and then went out for grub. While enjoying a meal at the outdoor cafe, we discussed our plans for the day. 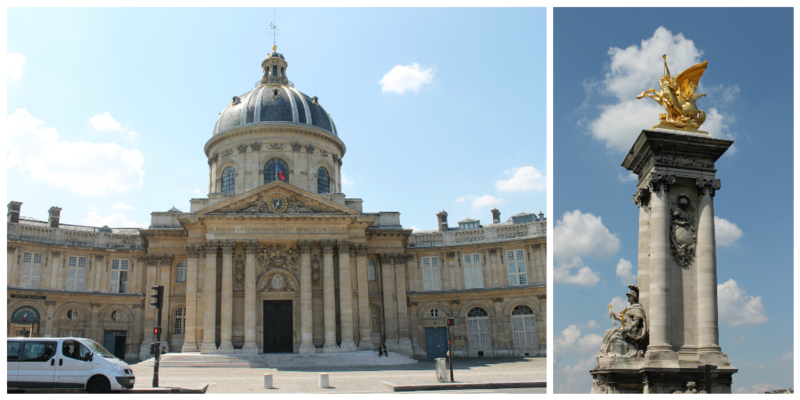 We planned to hop on the RER C from right where we were to go to Versailles. Plans failed when the station was not servicing the line we needed. Grrrrrr. So we had a choice A.) walk to the next open station, approx 1.5 miles away, or B.) take a longer route from that station. No one gave their opinion, so Luke said "all right we're walking!" After walking and walking, we were all pretty sweaty (this was late July in Paris after all where temperatures are in the high 80's). 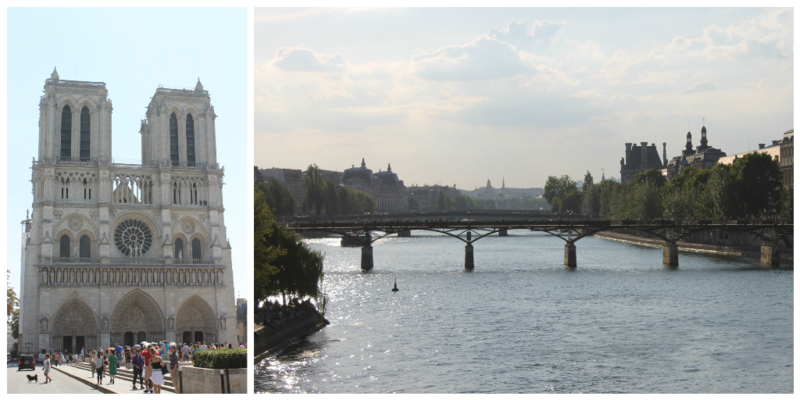 Some of us were a bit grumpy from the trek, but on the positive side, we walked along the river and saw some of Paris' beautiful architecture along the way! When we finally arrived to Versailles, we decided we weren't going to go into the palace. Luke and I already knew we didn't want to as we had already been there and done that and had a not so great experience with crowding. The four of us took the side entrance around to the garden. 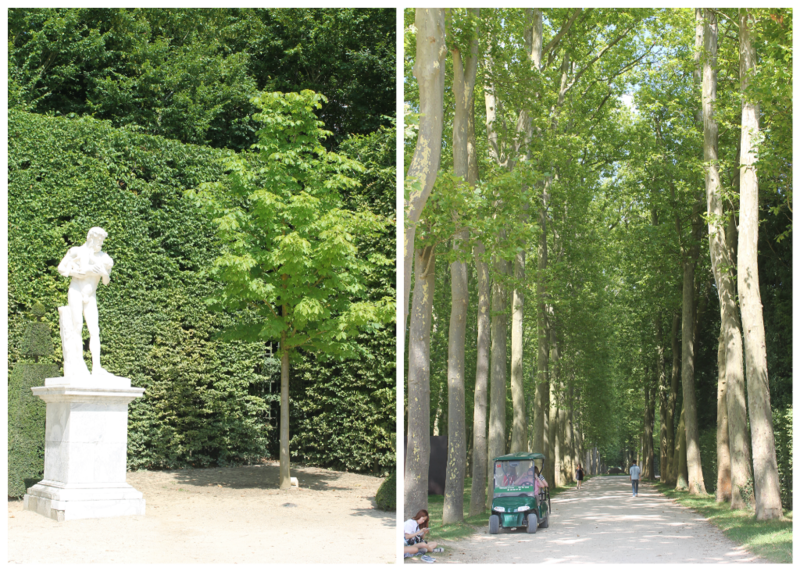 The first time we went to Versailles was during the winter, so many statues were covered with sheets, none of the fountains were on, no flowers were bloomed, and some of the trees were lacking in leaves. I had high expectations for this visit as it was summer and everything was supposed to be stunning! Well, I was let down quite a bit. Statues were all visible - positive. Fountains were not on - negative. Flowers were bloomed - positive. Trees had leaves - positive. Okay, so maybe I am making a bigger deal about it that it was. The problem was that for a few weeks of the year, Versailles puts on a fountain show with music and lights, so I assume this is why the fountains were not on. Besides that, I expected more flowers. They were pretty and all, but there weren't as many as my mind dreamed. Anyway, the four us hopped in the golf cart line, so we could drive around the premises rather than walking in the heat. It was nice to drive everywhere, but we were limited on time and where we could go. It was fun though! We were all a bit tired from an early morning, so we hopped on a bus, thanks to CityMapper Paris, to take us back to the hotel. On Saturday morning, we started with a crepe (or two) for breakfast before we metroed up to Montmartre. 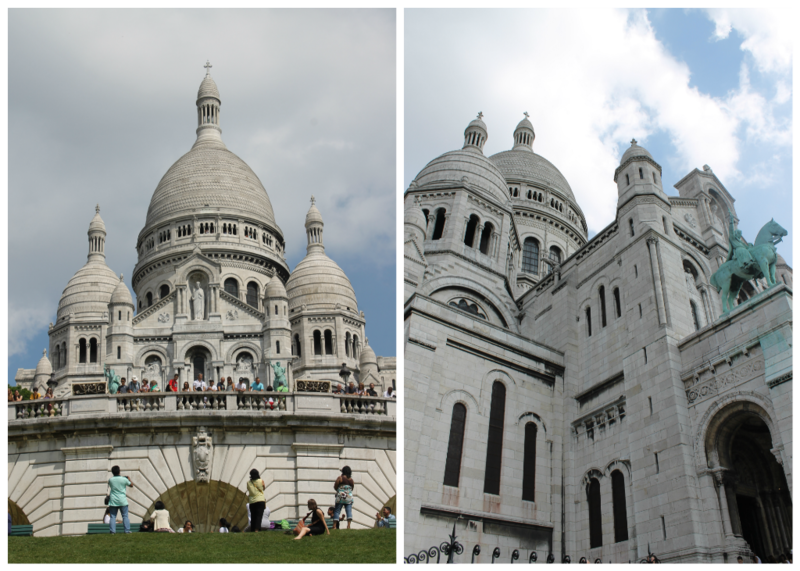 We started by climbing our way up the stairs to Sacre Coeur. Beautiful as always! Then we wandered around in the area for a bit. Jill did not get a chance to explore much in Montmartre during her visit to Paris in 2013, so we showed them the artist area where hundreds of paintings are on sale. The cafes in this area are so cute which makes it difficult to choose one for a rest. We eventually did though. After refueling, our legs were moving again. We passed by the popular Moulin Rouge, which we actually looked into tickets prior to the trip, but determined we'd spend our 200EU on beer and wine instead. Next, we came upon the Opera which is one of my favorites in Paris - the interior is gorgeous! But we only stayed outside. Continuing south brought us to The Louvre, which we did not enter. My third time in Paris and I still haven't been into this massive art museum. Maybe next time, Mona. We started the long walk along Champs-Élysées toward the Arc de Triomphe. Jill and I really really wanted some macarons, but when we saw the line for Laduree, we said no thank you! Instead, we stopped for a drink at a cafe on a side street. The heat was brutal! Continuing along, we finally ended up at the Arc de Triomphe. Our plan was to buy tickets but not go in until the night. We had heard how beautiful of a view it is at night. After waiting in line, the lady told us that we could not buy tickets early for the night. Ugh! So Jill and I stomped away and then met the boys at a pub for a drink. We stopped for dinner soon after our drink. 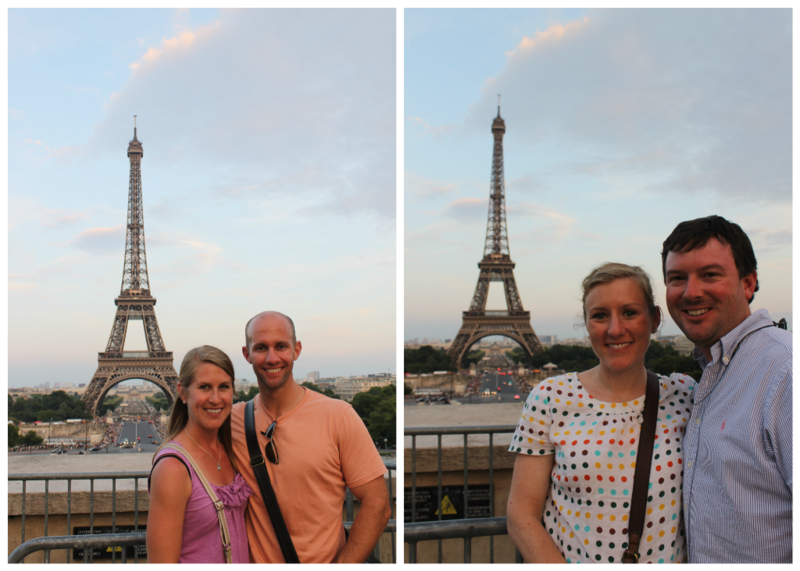 But then once again we were on the move, so we walked to Trocadero where we would get the best view of the Eiffel Tower. It was almost 10pm which was our goal time for being on top of the Arc de Triomphe, so we trekked it back to Charles de Gaulle - Étoile. We got our tickets, then climbed to the top. 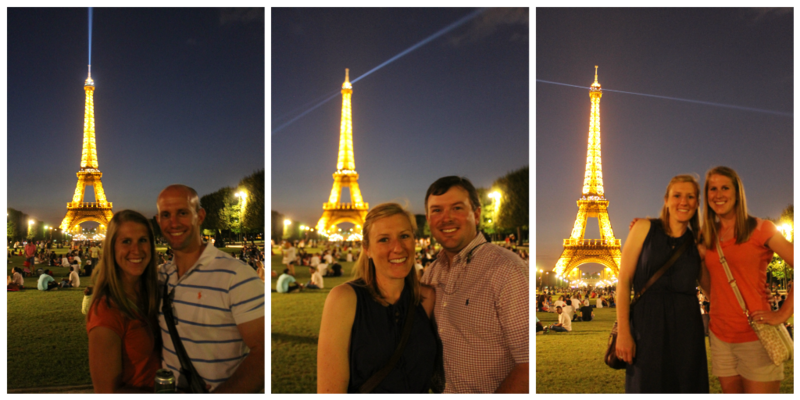 Just as we arrived, the Eiffel Tower began to sparkle! Unfortunately, hundreds of other selfie-taking people had the same brilliant idea as us, so it was very crowded and practically impossible to get a really good picture. We made do though and even got a few with us in it. 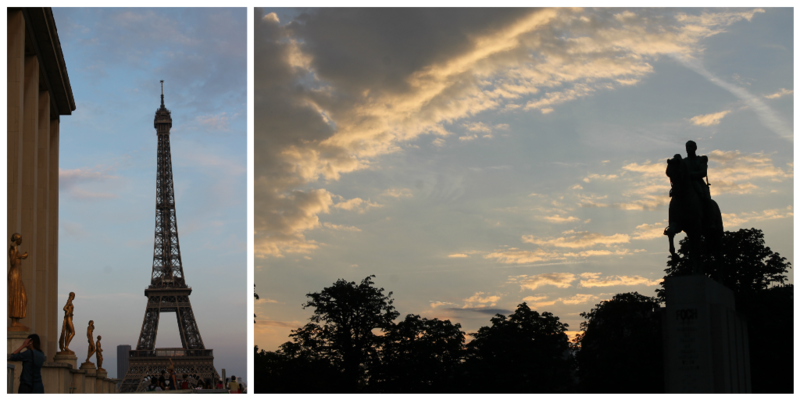 Besides the Eiffel Tower, the views all around were really nice! After we were finished, we hopped on the metro back to St. Germain. We got some ice cream, bought a few walking beers, walked along the river a little bit, checked out Pont des Arts (the lock bridge), and then headed back to the hotel for the night. 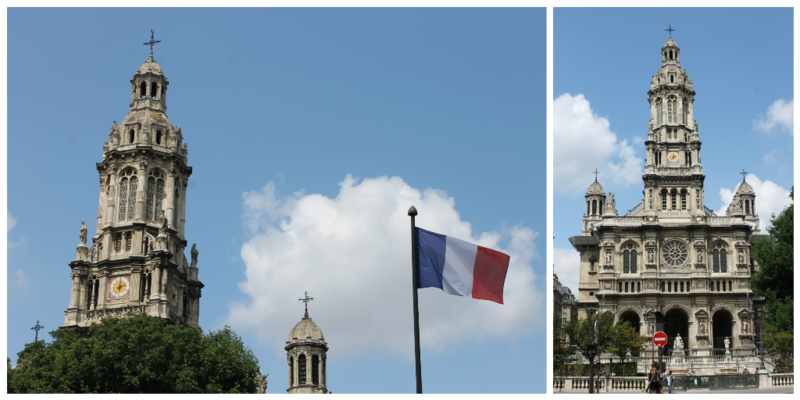 We only had one last thing we wanted to see/do in Paris before we left: visit Luxembourg Gardens. The gardens weren't too far from the hotel, but as we had our bags with us, we took the bus to get there. When we arrived, the gardens were actually closed for a special event, so we switched our plans a bit and decided to get breakfast in the meantime. After breakfast, we could tell the gardens were back open so we went in to enjoy its beauty. It isn't a huge park, but its very relaxing and has lots and lots of shade due to many trees. Everything about this garden is beautiful: the pond, the palace, the flowers, the happy families, pony rides - it's a great place to get away from bustling Paris! Then the time came for us to go our separate ways :-( We were able to ride the train together to Gare du Nord where Luke and I had to get off for our train home. It was a great weekend with some of our best friends - I'm glad we got to visit together! Third time in Paris and still love it! I can't finish this post without mentioning the sad events that took place in Paris last week. It is a reminder of how fragile our lives are no matter where we live, and we should not take a moment of it for granted.